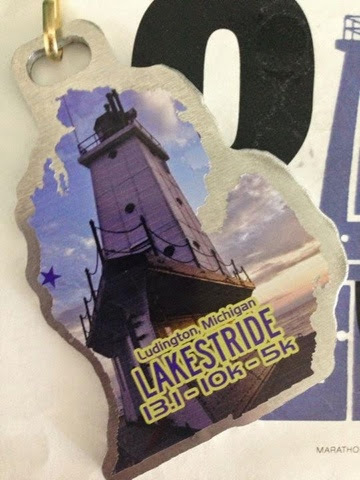 On June 14th I ran my third Lakestride 5K. I didn't do the race last year because I'd just had surgery (and even walking it would've been too much for me) so I decided to join in on the fun again this year. The race starts in the road by our local beach and is a loop type race. It goes through a local campground (on gravel/dirt - grrr!) before heading out to another road and coming back around. It's a pretty good race and not a bad way to start the morning! There are also options for a 10K and a Half Marathon. I opted to do the 5K rather than the 10K since I'd done something to my knee after my last 10K. My chiropractor thought it was a good idea to to a shorter race too. I ran it slower than normal - my slowest 5K to date, actually. But I was okay with that. I had my knee taped but it was bothering me a little bit. I felt it buckle a few times during the race, so I kept it slow and walked if I had to. I think I only walked three times for short periods. Mostly, I kept it to a slow jog, which seemed to be a decent pace for me that day. I knew that my time would be slower than normal so I wasn't really surprised, or all that concerned with it. My main priority was making sure that my knee was okay and I didn't fall on my face. I'd rather have a slow time than a DNF because of an injury from pushing too hard! It was nice to just get out and get some fresh air and exercise. I couldn't think of a better way to start the day! A local family was struck with tragedy not long ago - a young mother and baby died and her other daughter survived but was very critically injured. They weren't sure she'd make it - but she did. 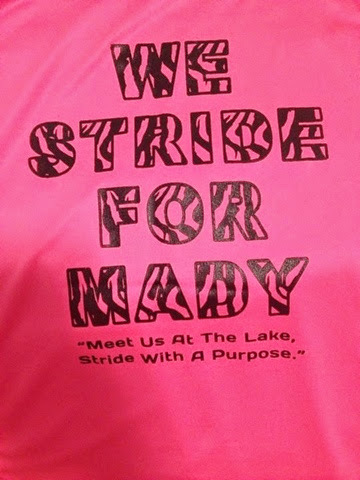 So on race day, a local group of runners decided to dedicate their runs to the little girl. I purchased a shirt and funky socks (the little girl's favorite - pink and black zebra!) that I wore on race day. I was going to wear a sparkle skirt with it but my pink skirt was too different than the pink in the shirt and socks, so I skipped that part. After the race I went out to my cousins' (Little Miss and her Auntie) horse show. I found out that the class Little Miss was in (eight and under lead line) was dedicated to the memory of the little girl's Mom and baby sister. 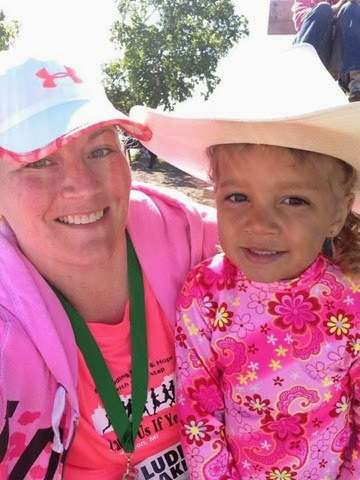 I had no idea it would be so it felt really awesome to have participated in a race for the little girl and to then attend a horse show in memory of her family! Overall, it was not my best race but I'm not upset about it. I honestly just felt good about getting out there and running!! 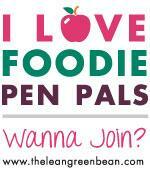 I can't wait to figure out what my next race will be - I have the fever back again!